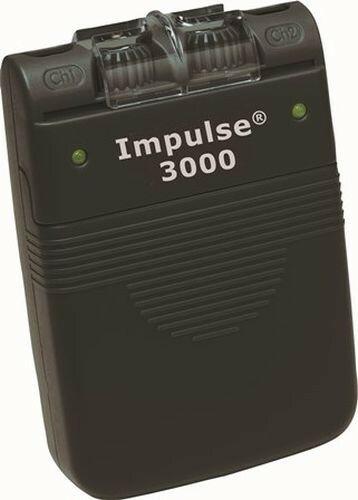 IMPULSE 3000 / 3000T is a dual-channel, analog portable TENS unit device that provides nerve stimulation to help ease different symptoms of pain. With three modes of operation, this electro muscle stimulation machine has three modes of operation and features covered amplitude knobs, hinged battery cover and horizontal belt clip for comfortable wear. 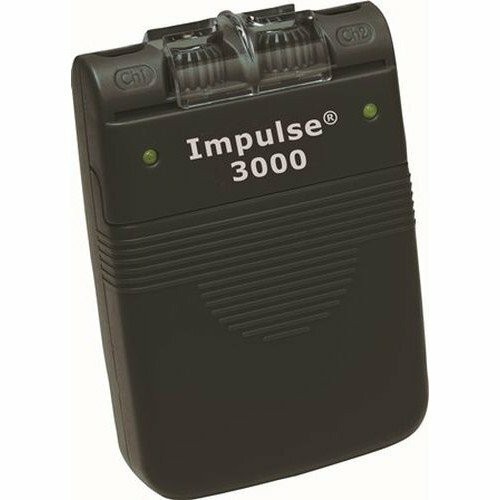 IMPULSE 3000 / 3000T is a kit that includes four pigtail electrodes, two pairs of lead wires, one 9-volt battery, a carrying case and instructions. This portable TENS unit also comes with a three-year warranty, making it the ideal electro muscle stimulationmachine for you or someone close to you that you love. You may also be interested in similar portable TENS unit devices, such as EMS Electrical Muscle Stimulator. Dual channel, analog TENS device provides nerve stimulation to ease pain. Three modes of operation that feature covered amplitude knobs, hinged battery cover and horizontal belt clip for comfortable wear. Kit includes four pigtail electrodes, two pairs of lead wires, one 9-volt battery, carrying case and instructions. The battery compartment is located in the back of the unit. It will slide open to display the battery; simply remove and replace. Does this require a special battery or can it use a regular 9volt battery? This unit operates on a 9V battery.